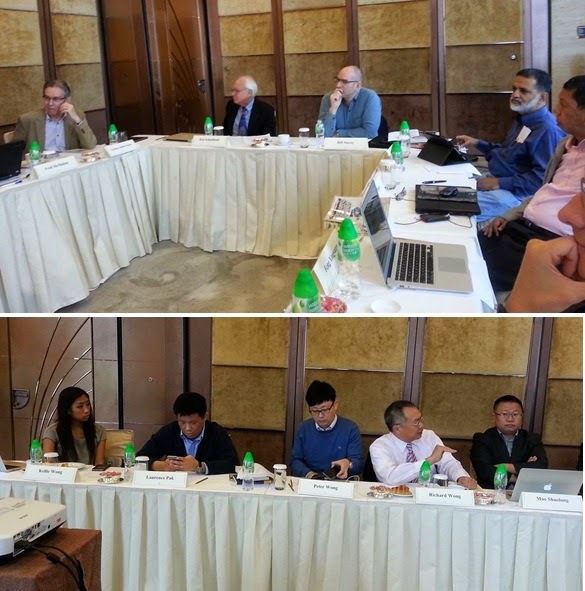 It was another stimulating discussion on "Policy Dialogue on IPR and Innovation", a small group forum for independent and market-oriented Asian think tanks held in Harbour Grand Hong Kong last November 5, 2014 and sponsored by The Policy Workshop (TPW), a NY-based public affairs firm. The night before the Policy Dialogue and after the Lion Rock Institute's Reading Club Salon 2014, TPW sponsored a dinner at the hotel. Our group photo below, a mixture of Reading Salon + Policy Dialogue participants. The small group forum was under the Chatham House Rule, we participants can mention the subjects and ideas discussed but not the persons who said them. It is a cool way to encourage honest, no holds-barred expression of opinions, observations and data. Here are two of the various slides presented that day. It shows that despite all those talks of "worsening inequality", "the poor getting poorer", "diseases destroying humanity", and thus, "governments should intervene more, centralize healthcare more", the facts say otherwise. We are living healthier, more disease-free, have longer lifespan, than our predecessors a century or many decades ago. 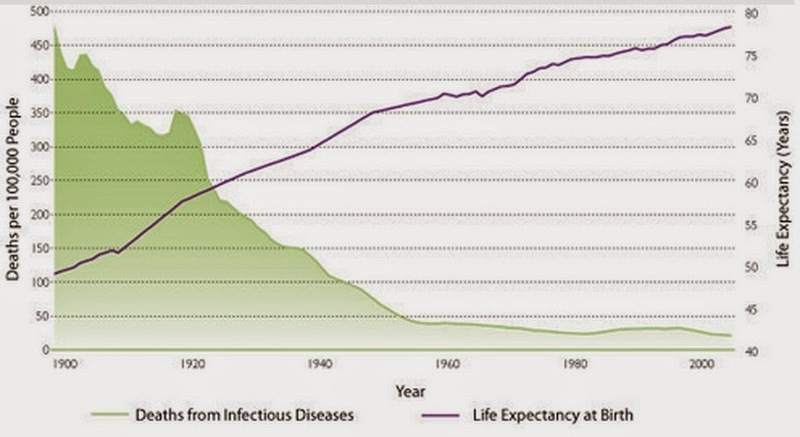 Related chart, declining death from infectious diseases and rising life span worldwide, 1900 to around 2013. Data from the Hamilton Project. 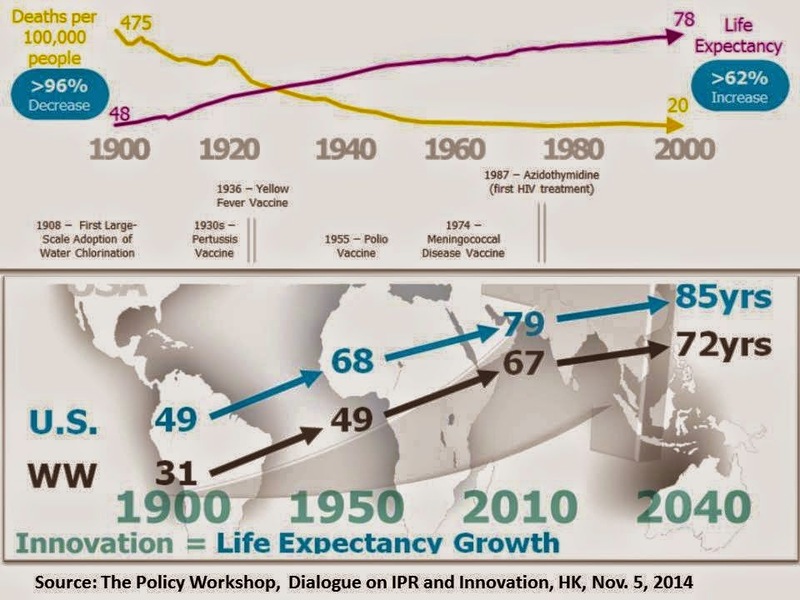 Among the main reasons for the huge decline in mortality was the control and effective treatment of infectious or communicable diseases, thanks to drugs and vaccines innovation. What used to be killer diseases have become preventable, and so people's lifespan has significantly increased. Drugs and vaccines innovation, competition among innovator companies, plus follow up competition from generic companies for off-patent drugs and vaccines, and not more government politics or price control, are the significant drivers for revolution in healthcare and declining mortality. 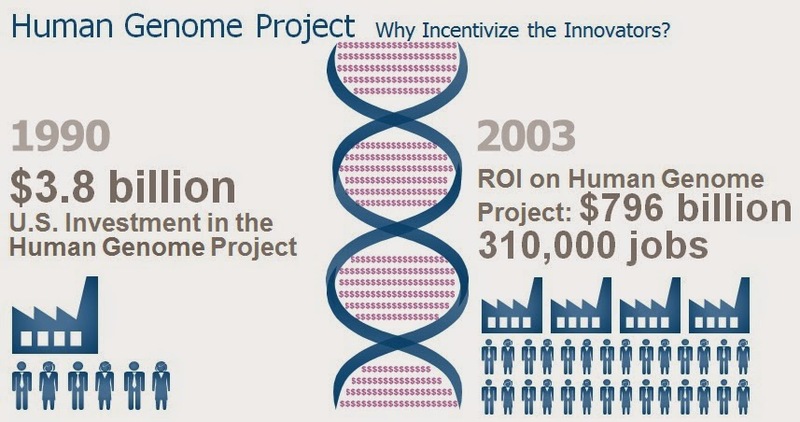 The Human Genome Project (1990-2003) is a successful, innovation-led project. Lots of jobs created, direct and indirect to biopharma sector, and billions of dollars of revenues for the companies and researchers involved, savings in public health spending. When people live longer and healthier, then they can work longer and more productively. Ahhh, cancer. My elder brother died of prostate cancer. My sister in law, his wife, died earlier of pancreatic cancer. Two of our wedding godmothers have died of cancer too. It is among the higher killers in modern society. But I notice that recently, average survival rate of cancer patients is slowly rising. 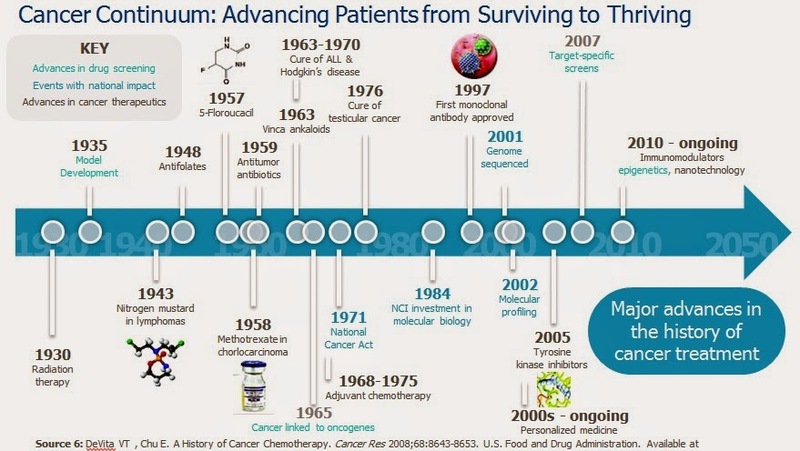 As modern science understand the various types of cancer better, various types of treatment and new medicines can be developed. 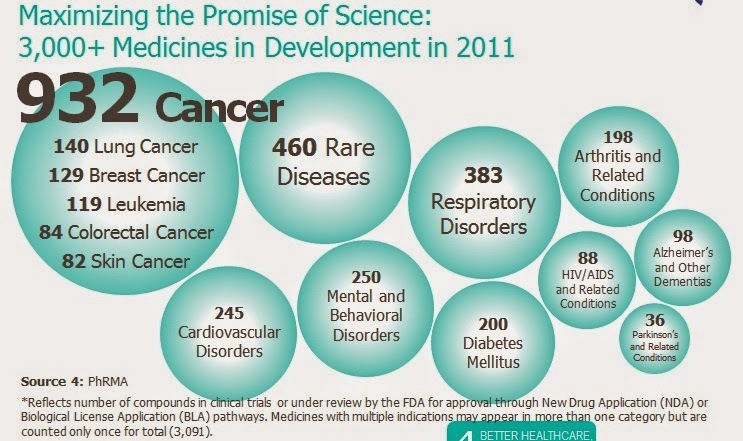 Expensive medicines at the start, those newly-discovered or newly-invented molecules, are to be expected. Why? 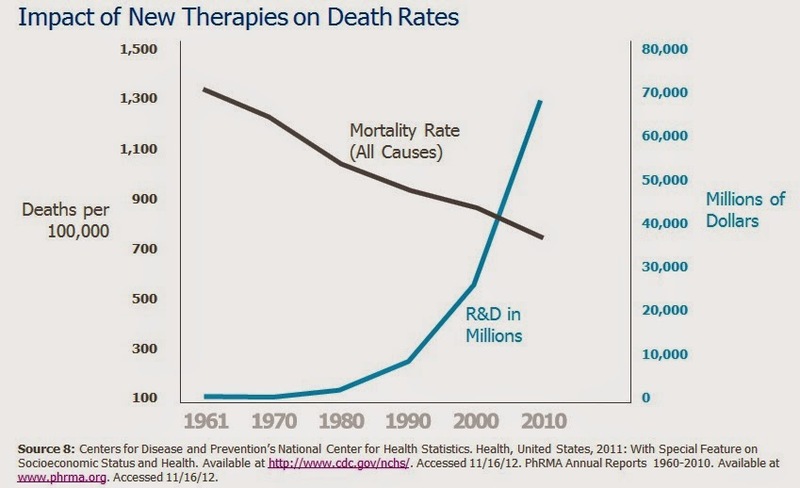 Because R&D, the long process of clinical trials involving thousands of people, is very costly. It is not cheap as some anti-IPR activists would argue. If they are right, then many of those big and medium-size generic firms should be doing drug invention and innovation as well but they are not. This slide attracted some comments from some of us participants in the dialogue. The anti-IPR activists can argue that IPR protection benefits mainly the US-based biopharma companies. One participant answered it, the critique is true because many US companies started it and continue to invest heavily in this high risk, high returns/high failure endeavor, and that explains the gap between the US and Europe, Japan, other countries. 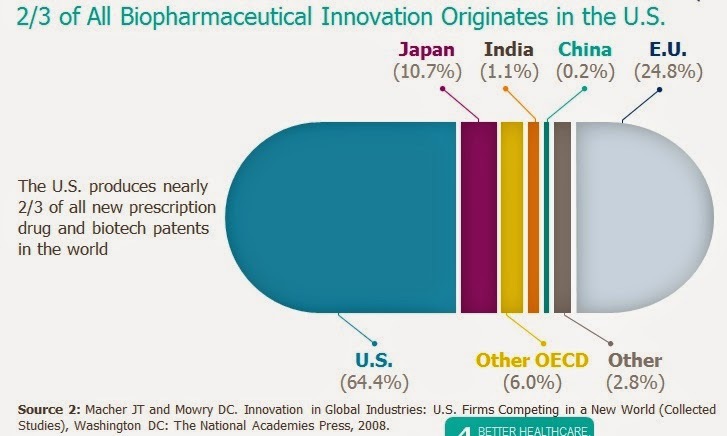 I think that instead of criticizing or demonizing the US-based biopharma companies, the critics should ask why there is not much innovation in Europe, Japan, etc. in biopharma sector. No one is prevented from putting up a high tech research company, no one is prevented from networking and collaborating with university research centers. Ok, this is among my favorite photos that dinner before the dialogue. 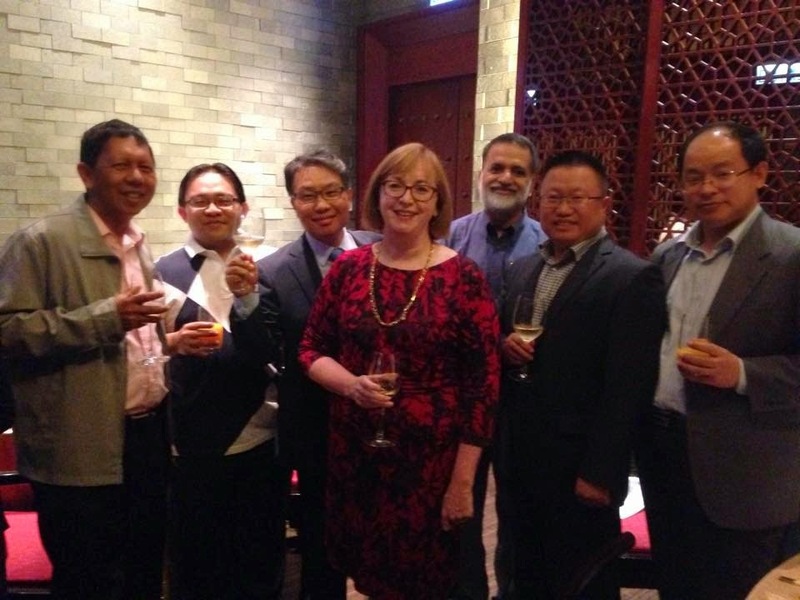 Six men from five countries (me from the PH, Wan from Malaysia, Choi from S, Korea, Barun from India, Mao and Feng from China) and Cathy Windels, the President of TPW. The six of us are among the regular or annual invitees of the EFN and we all participated in the Policy Dialogue. Cathy has worked with some of us since a decade or more, like Barun. I first met Cathy in 2007 also in HK through the International Policy Network (IPN) and then IPN President Julian Morris. Thanks Julian. Thanks again Cathy and TPW for such a wonderful and stimulating discussion. Lots of useful data, lots of insightful comments. 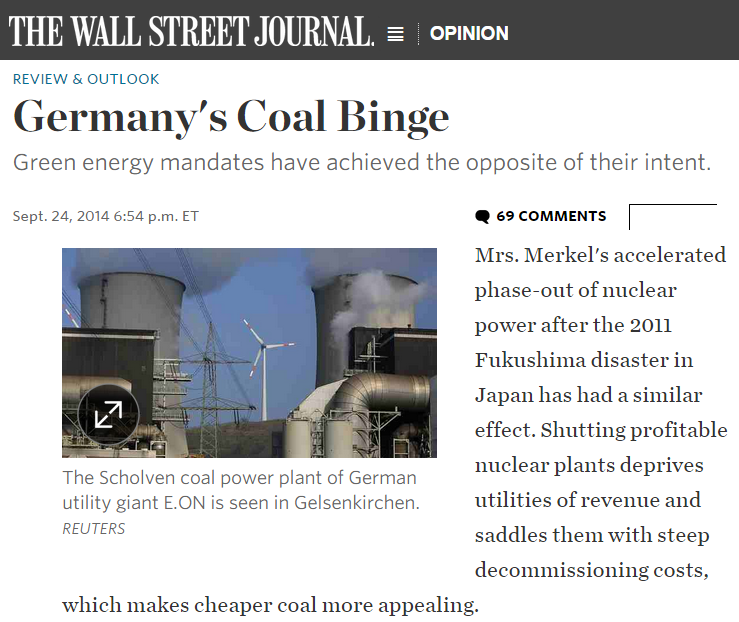 Here are more inconvenient stories for the lovers of Expensive-electricity-ok-so long-as-they're-from-renewables movement, focus on Germany's experience. Last week the CEOs of Europe's 10 largest utilities finally cried uncle and called for a halt to wind and solar subsidies. Short of that, they want subsidies of their own. They want to be paid, in essence, not to produce power. 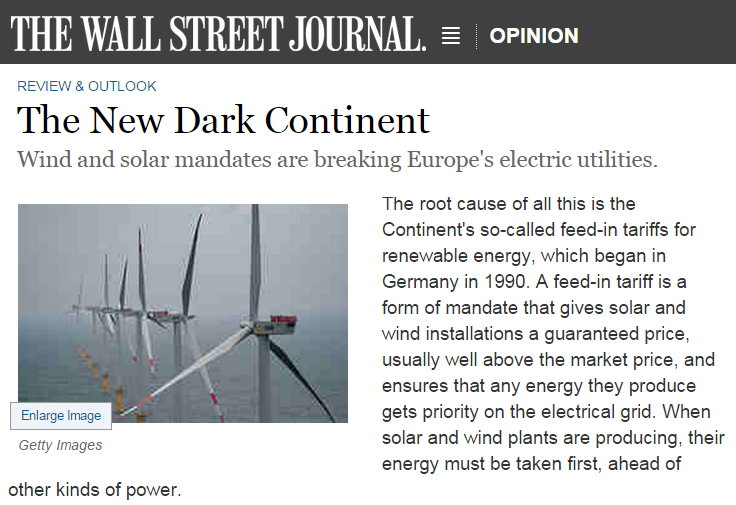 The root cause of all this is the Continent's so-called feed-in tariffs for renewable energy, which began in Germany in 1990. A feed-in tariff is a form of mandate that gives solar and wind installations a guaranteed price, usually well above the market price, and ensures that any energy they produce gets priority on the electrical grid. When solar and wind plants are producing, their energy must be taken first, ahead of other kinds of power. By requiring utilities to take this power—and requiring consumers to pay for it—Germany has increased renewables to 25% of its overall capacity. Berlin wants to push that to 35% in 2020 and 80% by 2050. Not every country in Europe has been as ambitious as Germany, but the European Union's renewables target across the entire Continent is also 20% by 2020. Germany will continue to need coal-fired power plants, its energy regulator said, warning that Europe's biggest economy should not rely solely on renewables or risk increasing exposure to Russian gas as it shuts down nuclear plants. "Those who call for an end of coal power generation don't have much interest in a reliable energy policy," Jochen Homann, president of the Federal Network Agency (BnetzA), told an energy industry conference on Wednesday. Only last year the share of electricity generated from coal in Europe’s biggest economy hit the highest in 24 years. The country also opened more coal-fired power plants in 2013 than any other time in the past 20 years as it moves towards a target set three years ago, which aims to have all nuclear power stations shut down by 2022. Germany’s energy revolution —or “Energiewende”— has come at a high price.According to Bloomberg, it has so far added more than $134 billion (100 billion euros) to the power bills of households, shop owners and small factories. 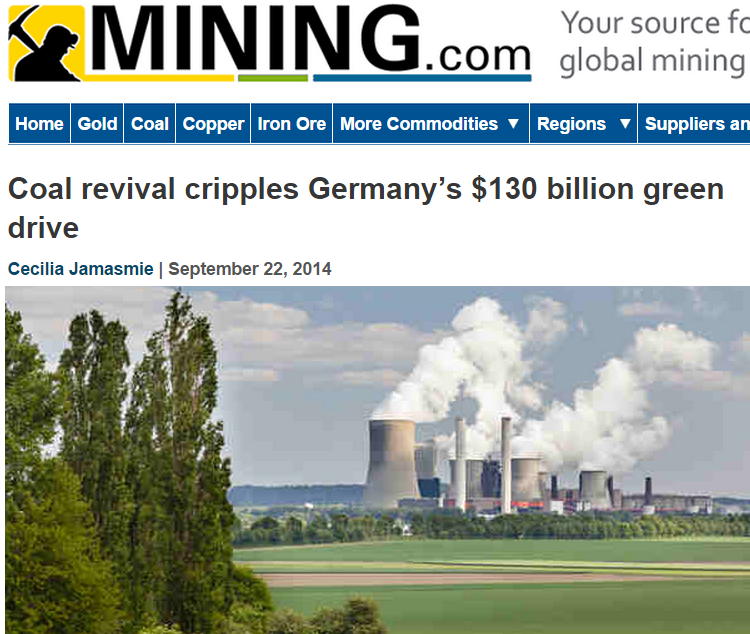 But falling coal prices seem to have wet the government’s appetite for the fossil fuel, to the point that Chancellor Angela Merkel’s governmenthas recently announced it considers coal-based power plants as “indispensable” for the foreseeable future. Greens profess horror at this result, but no one who knows anything about economics will be surprised. It's the result of Chancellor Angela Merkel 's Energiewende, or energy revolution, a drive to thwart market forces and especially price signals, that might otherwise allocate energy resources. Now the market is striking back. Take the so-called feed-in tariff, which requires distributors to buy electricity from green generators at fixed prices before buying power from other sources. 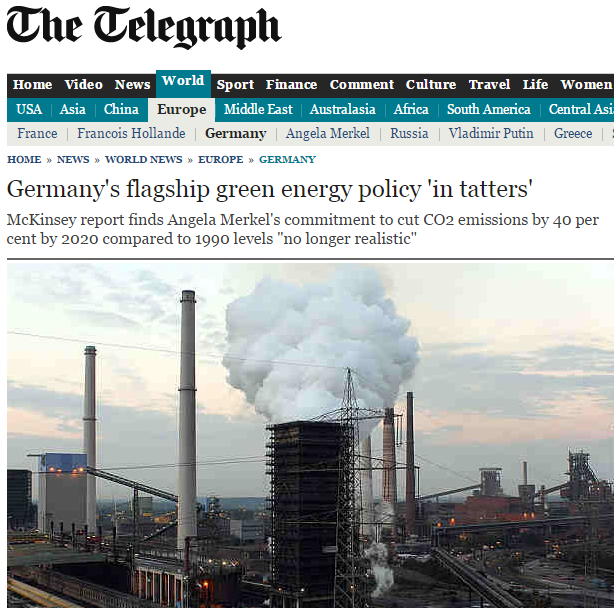 Greens tout the measure because it has encouraged renewable generation to the point that Germany now sometimes experiences electricity gluts if the weather is particularly sunny or windy. Ordinary Germans foot the bill for these market distortions, having ponied up an estimated €100 billion ($129 billion) extra on their electricity bills since 2000 to fund the renewable drive. The government estimates this revolution could cost a total of €1 trillion by 2040. German companies are concerned about the extra burden they fear will come with a new, higher climate protection target for 2030. 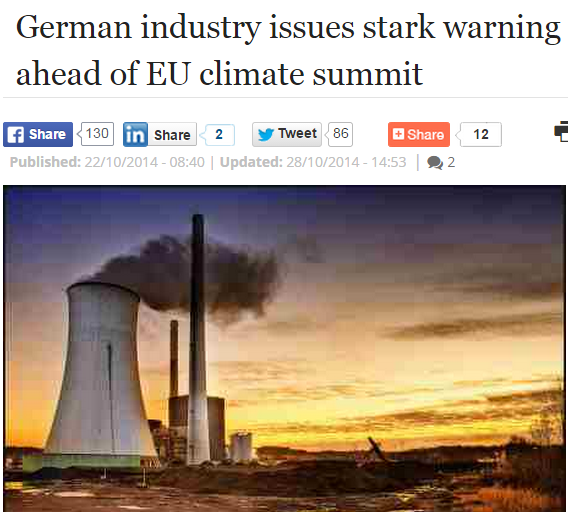 Utz Tillmann, a spokesman for the Energy Intensive Industries of Germany (EID) - which includes chemicals, steelmaking, cement and others - said he supported an ambitious agreement at the Paris UN climate summit in December next year. But these goals should include strong and comparable commitments for both industrialised and newly industrialised countries, he stressed. 11. (Not in the photo) Ernest “Ernie” Bower, senior adviser and Sumitro chair for Southeast Asia Studies at the Washington-based Center for Strategic and International Studies (CSIS). Good mixture of personalities. Is this a think tank of big business? Somehow Yes, with MVP there, heads of ECOP and COMP. Is this a think tank of academics? Somehow Yes, with known academics from UP Diliman (NIGS, CBA) and DLSU. Is this a think tank of civil society? 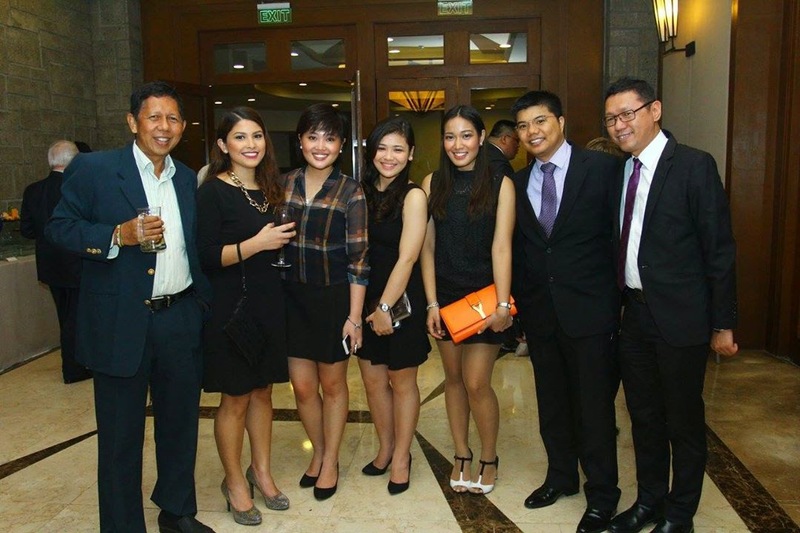 Somehow Yes, with PDI Publisher, Robredo Institute, FEF guys there. Again, good mixture of people with different professional backgrounds. 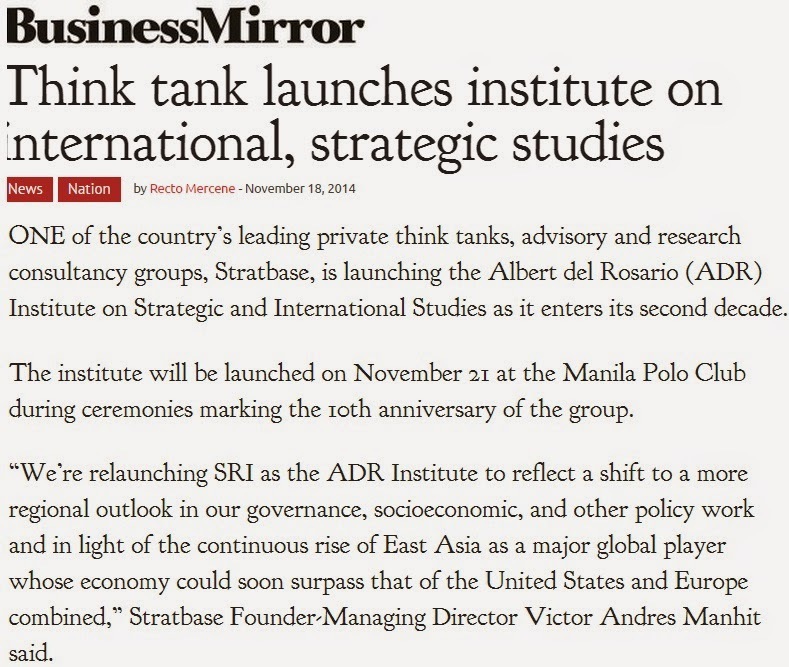 I think the think tank's main clients will be foreign governments (through their embassies in Manila), big firms at the Philippine Stock Exchange, PCCI, etc. I saw many diplomats and some ambassadors that night, including US Ambassador Philip Goldberg, cool guy. Some photos that night where I was an "extra". Below from left: Dr. Vic Paqueo of UPSE, PIDS, former WB/ILO consultant; Dr. Lingling Patalinghug, and Cong. Kit Belmonte. Vic was my former teacher in Econ. 181 (Labor Econ) while Ninong Lingling (yes, he's among my wedding godfathers) was my former teacher in Econ. 171 (Agri Econ) at UPSE sometime in 1983 or 84. Kit was a rich kid, mestizo, but very militant activist in UP then. From left: Dindo Manhit, Kit Belmonte, Vic Paqueo, Raul Pangalangan, Totol Batuhan, Lingling Patalinghug, Digitel President Doy Vea, me. 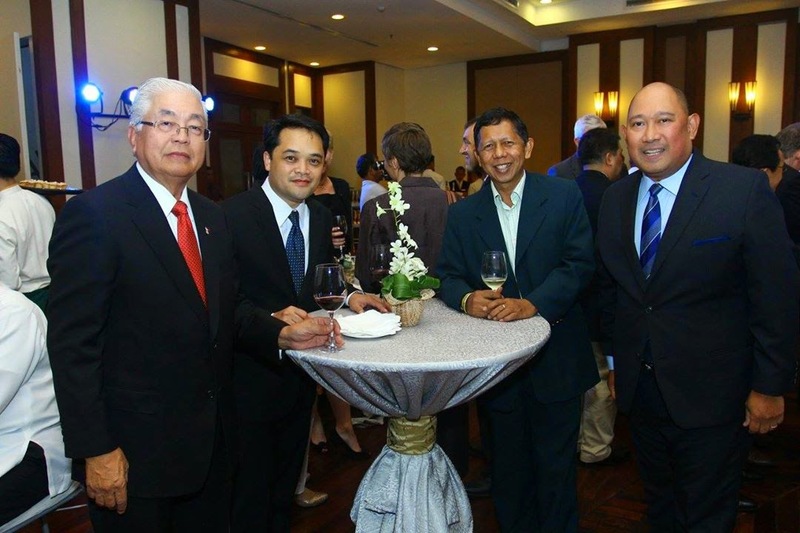 From left: Edgardo Lacson (PSE, PCCI, ECOP), Ronnie Recidoro of COMP, me and Dindo. The three of us were discussing about mining and mineral potential, lots of jobs, money and government taxes, of the country, then I dragged Dindo for the photo. Stratbase's young and dynamic staff, from left: Claudette Guevarra, Krystyna Dy, Bianca Soriano, Mikee Maralit, Lloyd Zaragoza. Me and Kiko Magno were extras here. Mikee is the one who directly invites me in some Stratbase/CitizenWatch events, she is a former student of my wife at DLSU. Minimal Government Thinkers simply networks with other think tanks, research institutes, and other civil society organizations, like Stratbase and ADR Institute. 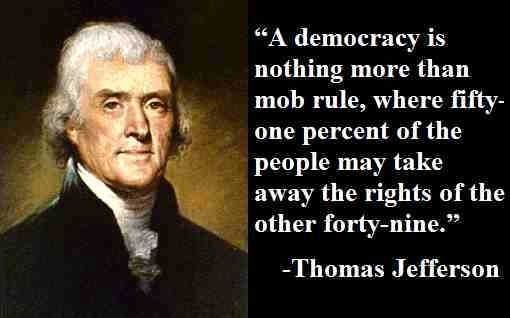 For us, minimal government = maximum civil society. Things that can be done by individuals and their voluntary organizations need not be assigned to government, local, national or international/multilateral. Because government = coercion. So a minimal or limited government means minimum of coercion in society. Thanks again for the invite, Dindo and Stratbase. Hope to see you in another round of discussions. All photos above from Stratbase fb wall. Here are some photos of the Lion Rock Institute (LRI) 3rd Reading Club Salon (RCS) 2014 held three weeks ago in Hong Kong. 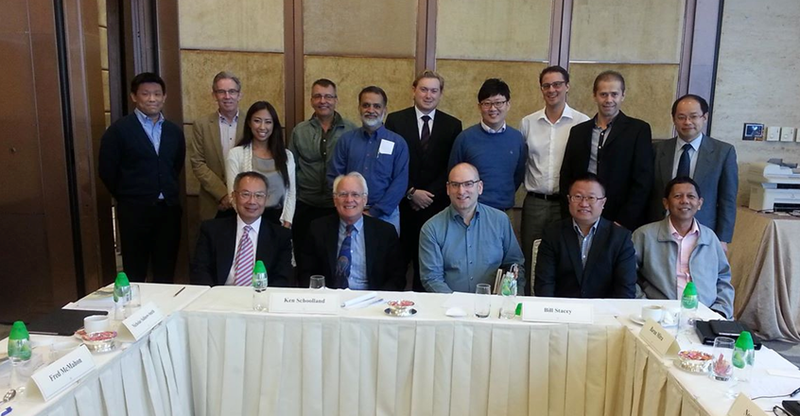 Below, our group photo after the morning session, moderated by LRI Chairman Bill Stacey (seated, center). The afternoon session was moderated by Ken Schooland (seated, 2nd from left) of the Hawaii Pacific University. LRI Executive Director, Peter Wong, is standing behind Bill. 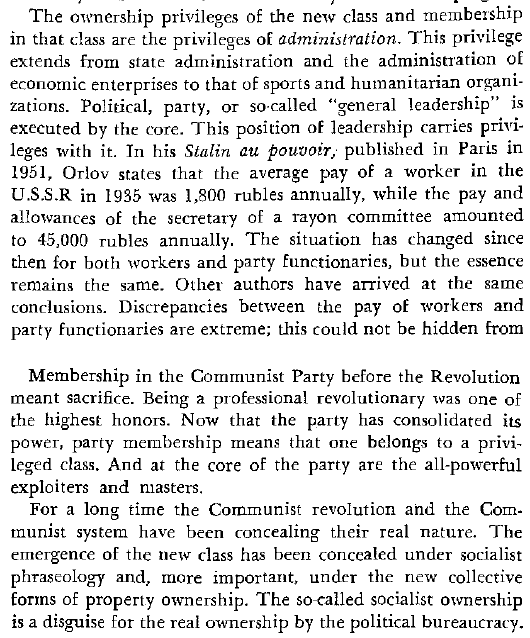 Milovan Djilas' book, "The New Class" (1957) was our take off discussion in the morning session. Bill asked something like, "Is there something in Marxism and its class analysis that makes it so appealing to the public and intellectuals?" Among those who answered Bill's question was Feng Xingyuan (CASS, Unirule, CIPA, in Beijing), standing behind me in the above photo. He reasoned that the term "class" (Marx's capitalist class and working class) is misleading because there are now many "in-between" sectors in society like small entrepreneurs who are also workers and managers of their own small companies, so who exploits whom? I agreed with Xingyuan and added that Marx’s class is indeed misleading and not useful, but Djilas’ concept of a "political class" is useful. 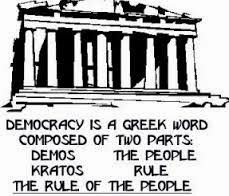 Not only in national and local governments political class but also those in the international, multilateral and bilateral bureaucratic class. Good example is the UN, its attached or partner organizations and institutions, in pushing alarmism and more government intervention in crafting climate and energy policies. Nick Smith (The Link, HK) added that aside from Djilas' bureaucratic class, there is also the managerial class, An expansion of "class". Fred McMahon (Fraser Inst., Canada) noted that with global competition, political nepotism has drastically declined in dispensing power and privilege in many countries. Xingyuan added his observation that the Chinese government's power has increased, there is "methodological individualism", a class of people within the government doing detrimental things. An expansion of the concept of "class" may be ok but “class struggle” is not appropriate. More of “interest struggle” within governments, within businesses. Here are some points by Djilas in Chapter 3, "The New Class". It talks about huge inequality between the ordinary citizens and the political class, the huge privileges of the latter, a capitalism "disease" that a communist society is supposed to correct, not continue and even exacerbate. This did not happen of course. And a portion of Chapter 4, "The Party State". 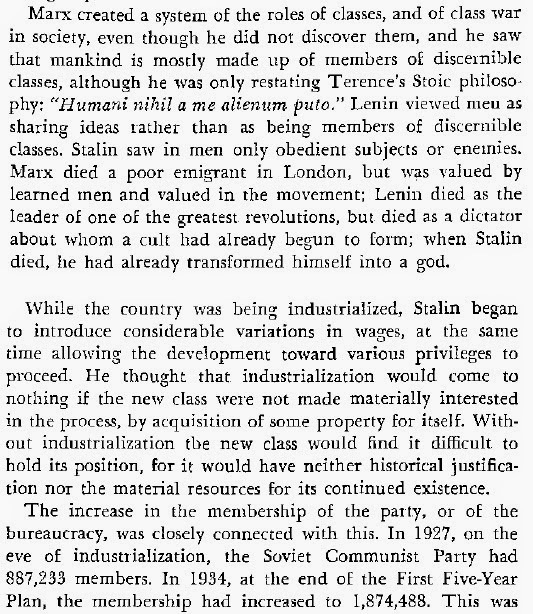 Djilas made a quick survey of Marx, Lenin and Stalin, their differences in personality, in one paragraph. Then the expansion of the communist state under Stalin. Djilas' book should be read or browsed by current socialists and bleeding heart activists, government and foreign aid bureaucrats and consultants. Their new mantra of "alarming social inequality" points to only one thing -- even bigger governments (local and national) and multilateral institutions (UN, WB, ADB, IMF, etc.) whose main goal is to further redistribute by force and coercion, the wealth and assets of the more hard-working, more efficient, more ambitious sectors of the planet. This is a different "class" of people. They enjoy the products and innovation of capitalism and individual excellence, then turn around and demonize the free enterprise system, and call for more regulations on top of existing multiple and rigid regulations. Sincere and non-envious scholars and researchers should not demonize capitalism and high inequality. Rather, they should demonize policies that prevent the poor from taking advantage of the momentum of innovation and competition. Or create a culture of entitlement, dependency and mendicancy among the poor. Thanks again to LRI for another stimulating, small group discussions. 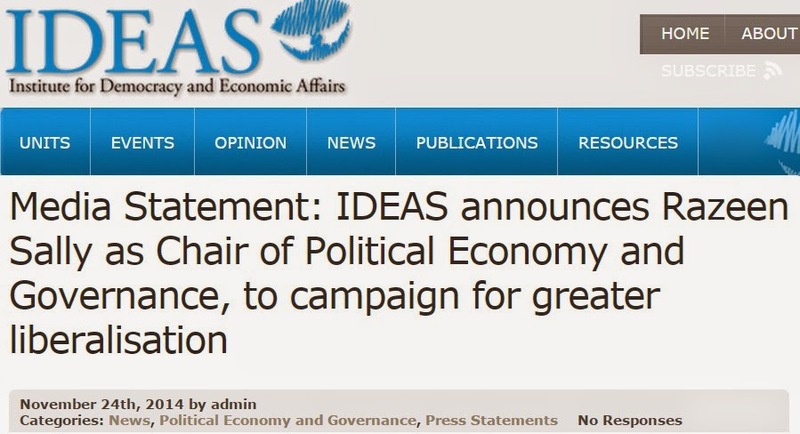 Kuala Lumpur, 24 November 2014 – The Institute for Democracy and Economic Affairs (IDEAS) announces today the appointment of Dr. Razeen Sally as the first holder of IDEAS Chair of Political Economy and Governance Programme. Dr. Sally is a globally renowned expert on international trade policy. 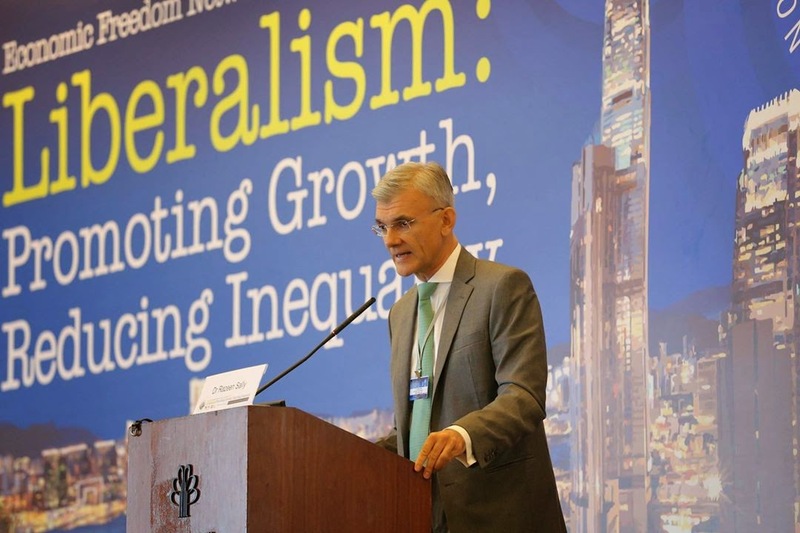 He is Director and Co-founder of the European Centre for International Political Economy (ECIPE) and a Visiting Associate Professor at the Lee Kuan Yew School of Public Policy. He was a faculty member and PhD graduate of the London School of Economics (LSE). He has published numerous works on global trade policies, global economic crises and the Asian economy including the ASEAN and Chinese economy. Dr. Razeen Sally is a world-known scholar advocating free trade. In 2008, he produced this book, published by Cato Institute in the US. Also in 2008, he produced this e-book, "Trade Policy, New Century: The WTO, FTAs and Asia Rising" , published by the Institute of Economic Affairs (IEA), London, 2008. The book summary enumerated these major arguments why free trade is good. 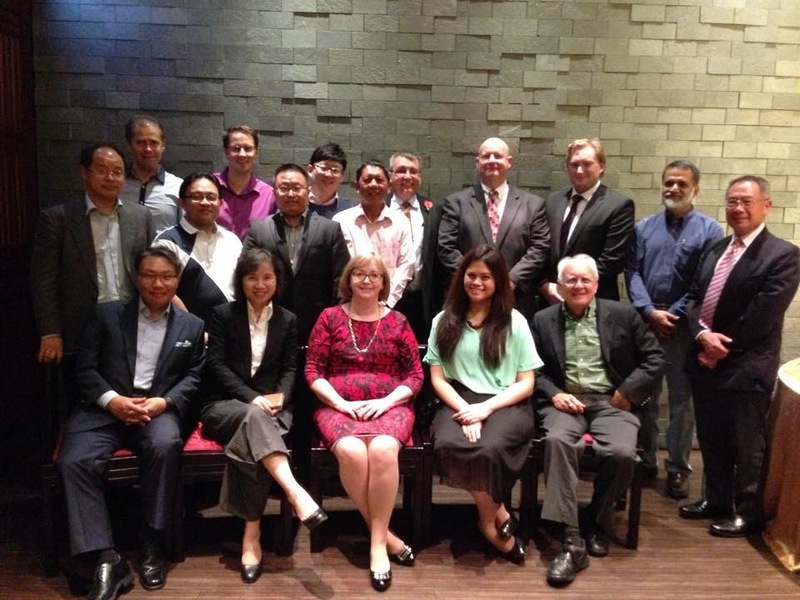 Photo below was taken during the EFN Asia Conference 2014 in Hong Kong. • Ideas about free trade started in the West and were originally exported to the rest of the world. But, today, the major challenges for trade policy come from Asia. • Trade is still the engine of prosperity and the handmaiden of peace. The ‘New Globalisers’ that have been freeing trade have seen rapid economic growth, reductions in poverty and improvements in welfare. 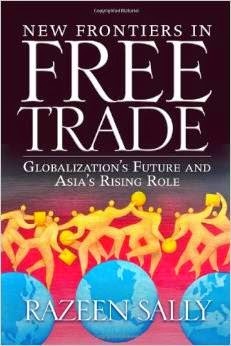 • The authentic case for free trade should be set in the context of classical liberal political economy and, as such, Western political opinion needs to move on from considering the promotion of free trade as a top-down process driven by supranational institutions. Instead it should see free trade as an integral part of a domestic liberal political agenda. • Supranational organisations, including the World Trade Organization (WTO), have become too unwieldy to be effective in promoting radical trade reform; they should focus on ensuring that their rules are implemented effectively rather than on seeking radical liberalisation. • Protectionist interests are alive and well and have influence both within individual countries, such as the USA, and within supranational organisations. • The relatively liberal Western democracies should focus their trade policy on removing remaining explicit protectionist barriers but, perhaps more importantly, also on simplifying and making more transparent inhibitions to trade such as rules of origin and anti-dumping provisions. It is also important that a ‘culture of evaluation’ develops in the West so that implicit barriers to trade are properly scrutinised – especially within the EU. • Slower reformers, generally lower-income countries, should focus on lowering tariff barriers and quotas – they generally lack the governance capacity to implement more complex reforms. Less developed countries need to lower their tariff barriers between themselves. • There are over 180 Preferential Trade Agreements (PTAs) in force. PTAs are spreading like wildfire throughout Asia. In practice, many tend to be ‘trade light’ tools of foreign policy and diplomacy. • Those Asian countries that have successfully integrated into the world economy have done so through unilateral liberalisation. China has reduced its tariffs from an average of 65 per cent twenty years ago to 10 per cent today. This process of unilateral liberalisation must continue, but the USA and the EU need to ensure that the right background for liberalisation exists by eliminating protectionist rhetoric and actions, such as so-called ‘anti-dumping’ measures. • A classical liberal, ‘small-government’ domestic culture, which includes the promotion of unilateral free trade, will help ensure that the development of free trade is not knocked off course by vested interests. Dangerous vested interests include those promoting protectionism in the name of environmentalism, protecting strategic industries or promoting domestic security. 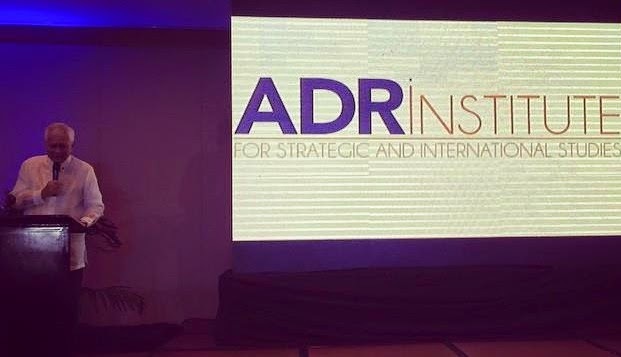 Last Friday, I was one of the invitees of Stratbase Consultancy Group in relaunching the Stratbase Research Institute (SRI) into the Albert Del Rosario Institute for Strategic and International Studies (ADR-ISIS). It was also the 10th anniversary of Stratbase. A number of academic and corporate VIPs there, and only two legislators. 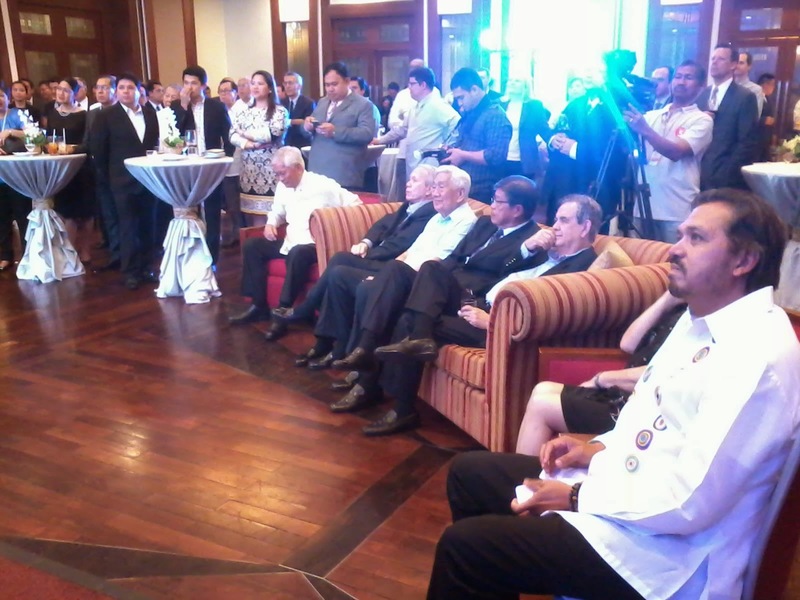 Good crowd, it was held at the Manila Polo Club in Makati. Seated below are among the Board Members of the new think tank. 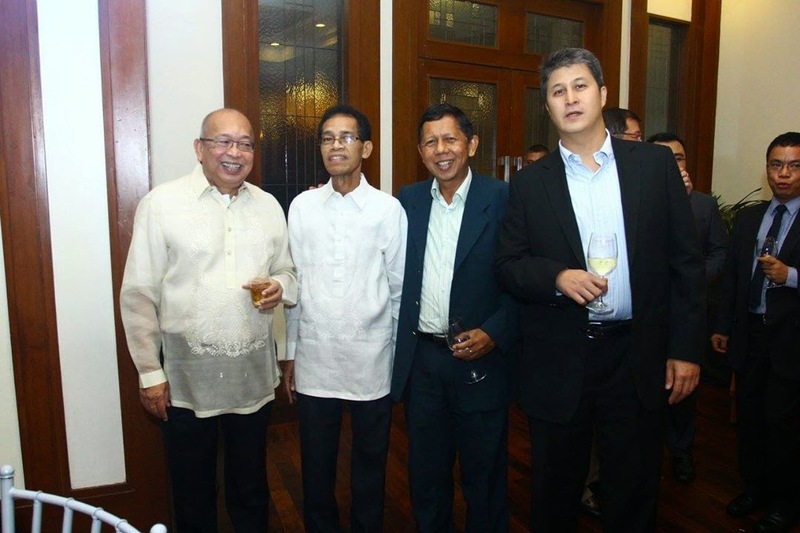 From left: Dr. Epictetus Patalinghug of the UP College of Business Administration, Manny V. Pangilinan, head of Metro Pacific Investments, Smart/PLDT, Meralco, TV5, etc; Dr. Rene de Castro of DLSU International Studies Department, Dr. Francisco Magno of DLSU Political Science Department. 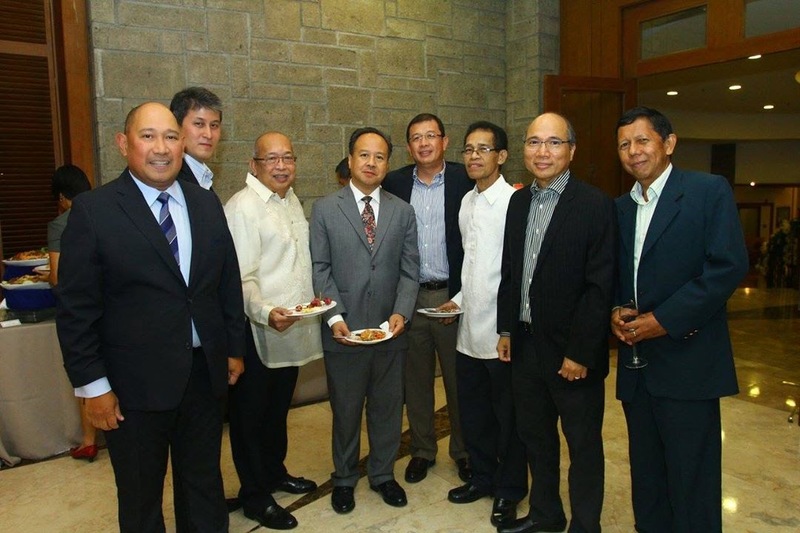 The other board members are Dr. Primo “CP” David of UP Diliman Geology and Environmental Science, Atfy Raul Pangalangan, former dean of the UP College of Law and publisher of the Philippine Daily Inquirer, Benjamin Philip Romualdez, President of the Chamber of Mines of the Philippines (COMP), Edgardo Lacson, honorary Chair of the Philippine Chamber of Commerce and Industry (PCCI) and President of the Employers’ Confederation of the Philippines (ECOP), and Ernest “Ernie” Bower, senior adviser and Sumitro chair for Southeast Asia Studies at the Washington-based Center for Strategic and International Studies (CSIS). 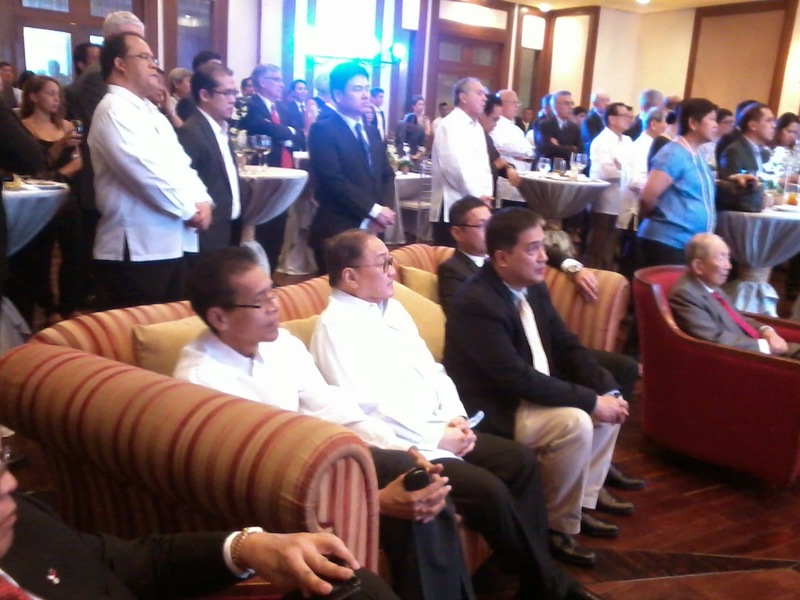 Photo below seated, DFA Sec. 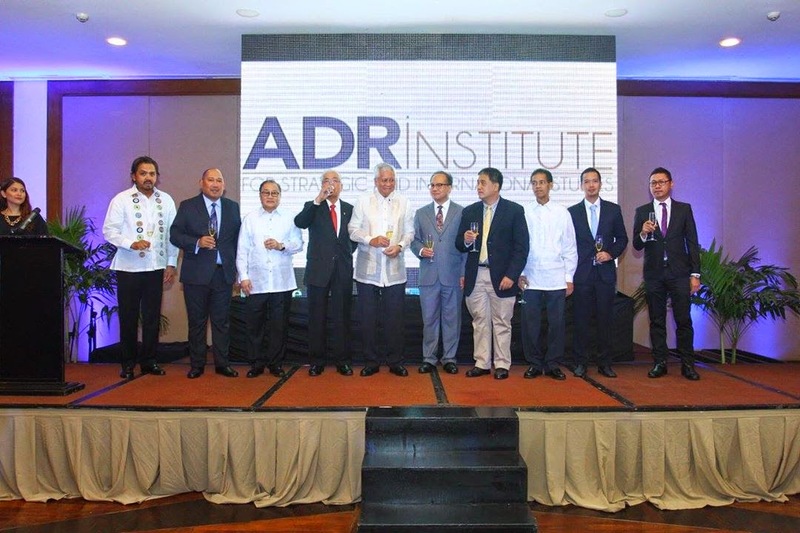 Albert del Rosario (ADR), four Ambassadors from different countries, and Mr. Romualdez of COMP. Sec. ADR giving a speech about the new think tank named after him. He was introduced by the founder and Managing Director of Stratbase, Prof. Dindo Manhit, after Dindo gave an overview of Stratbase's 10 years of accomplishments. A story from Business Mirror a day before the event. Similar story was reported by Manila Bulletin, The Tribune, Manila Standard and the Inquirer. I met a number of old friends and new acquitaintances there. 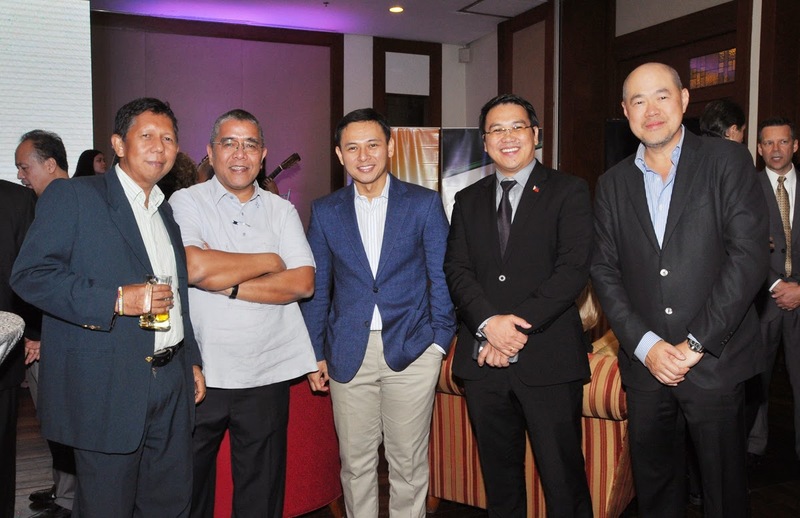 This photo from left: me, Gary Olivar who is a fellow UPSE alumni, also the Spokesperson of former President Gloria M. Arroyo, Sen. Sonny Angara, Arnel Casanova, President and CEO of the Bases Conversion Development Authority (BCDA), and Felix Ang, President of Cats Motors. 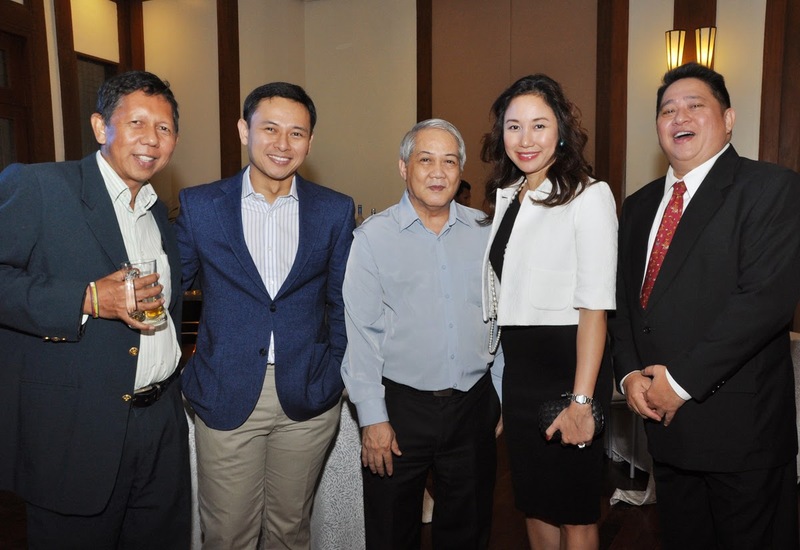 Again with Sen. Angara, Ramon Casiple, President of the Institute for Political and Electoral Reforms (IPER), Carol Manhit (Dindo's wife) and _______. Among the various UP Diliman guys and alumni that night. 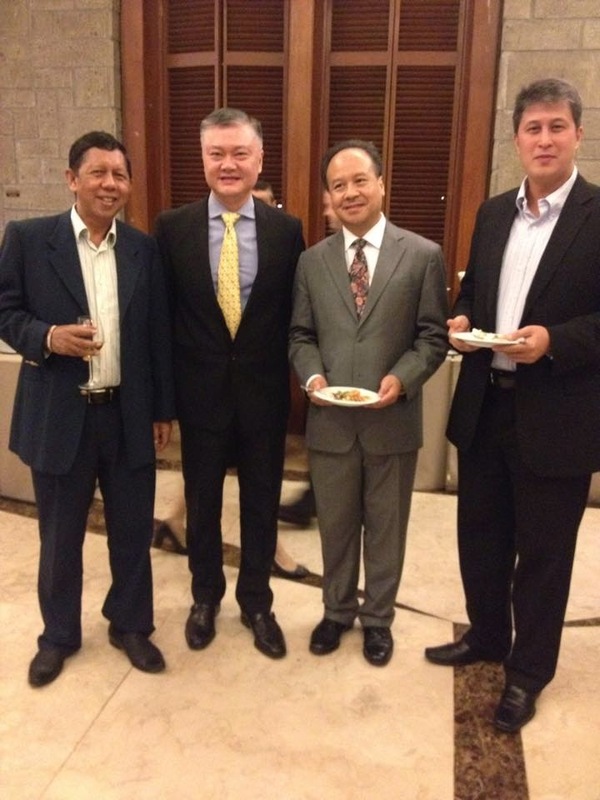 With fellow UPSE alumni Jeffrey Ng, President of Cathay Metal Corp. and Cathay Land, Raul Pangalanan of UP Law, and Cong. Kit Belmonte of Quezon City. Kit was a former famous UP student leader, coming from a very rich family yet a very activist, "mestisong tibak". With Prof. Kiko Magno, a DLSU Spanish visiting Prof., DFA Assistant Sec. for Legal Affairs Eddie Vega. Kiko, Ed and me are also fellow alumni of the UP Sapul, Polititical Science Club. Ok, ADR-ISIS is not a free market think tank advocating limited government, unlike our partner think tanks within the Economic Freedom Network (EFN) Asia, but I think the ADR think tank guys are open to hearing free market perspectives. For instance, I was a participant in two small group round table discussions held by CitizenWatch Philippines/Stratbase this year. And two of my papers, one on ASEAN free trade and the other on the Philippines power/energy and rice trade sectors, were published by SRI. Thanks to Dindo. I hope this informal partnership will continue in the coming years. Photos above from PBEST, Mikee and my cameraphone. 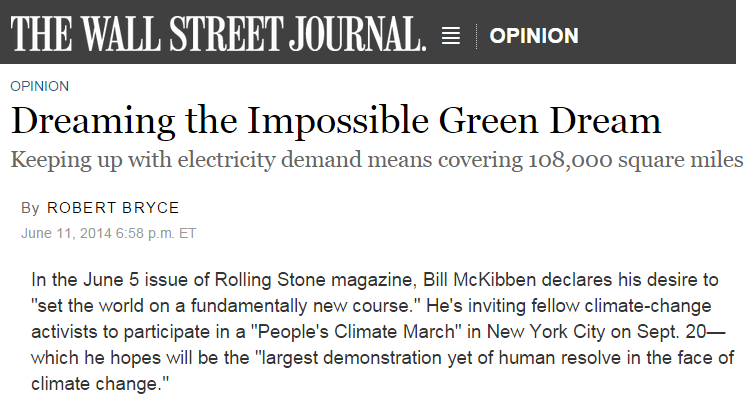 Some not-so-good news for the subsidize-renewables and climate alarmism movement. The green crusade of successive governments is set to double electricity bills for households and cost homes £26 billion a year by 2030, it was claimed yesterday. "The cost of renewable energy and carbon taxes will put an extra £983 a year on household bills by then, compared to relying on a mix of nuclear and new gas-fired power stations, three experts told a Lords committee. They also said the “foolhardy” green policy will do little to cut emissions of the greenhouse gases blamed for global warming. The Scientific Alliance report highlights warnings by the regulator Ofgem that the margin for electricityproduction for the 2015-16 winter will be at an all-time low of 2 per cent compared to the pre-privatisation requirement of at least 20 per cent. 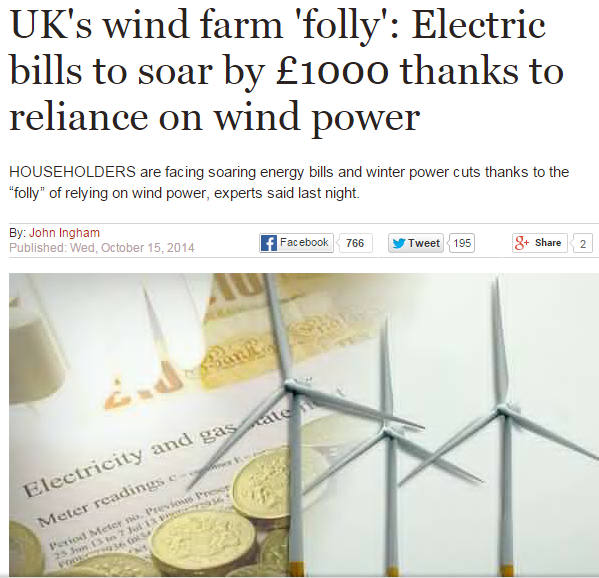 It means that in times of high demand, such as during very cold weather, Britain would be at risk of power cuts." The alliance argues that wind power – which is the main renewable energy source depended on by Government – is unreliable. The changes the government is making are expected to slow down the growth of solar farms in the countryside in England. There are currently 250 installed, with the biggest covering as much as 100 hectares. 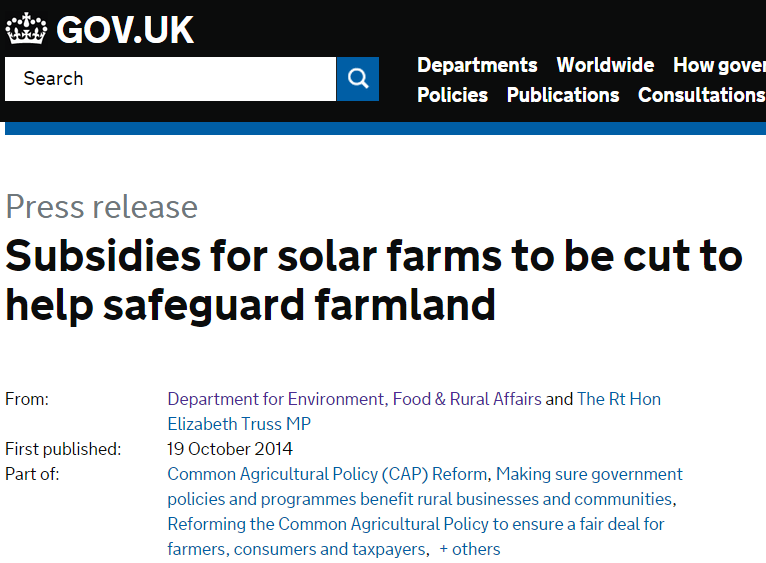 Under previous plans, the number of fields dedicated to solar farms was set to increase rapidly, with over 1,000 ground-based solar farms expected by the end of the decade across the UK. 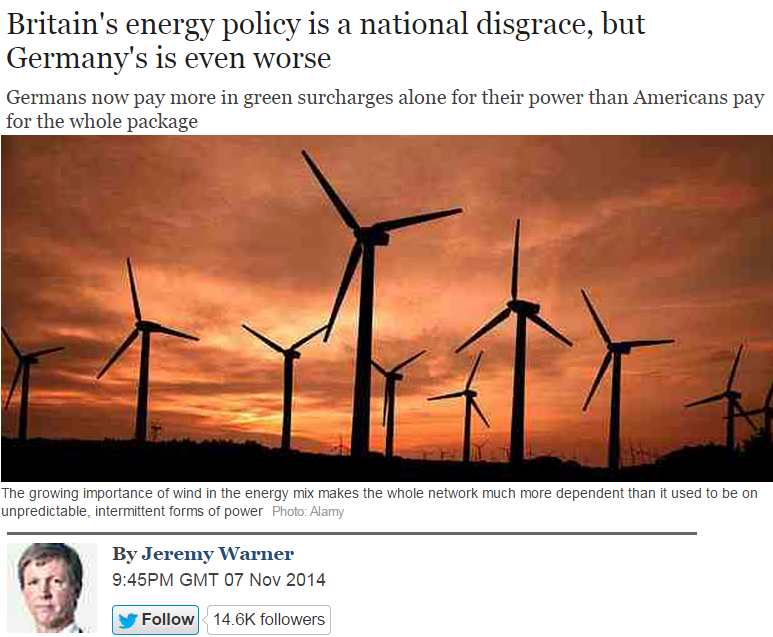 (3) From The Telegraph, October 21, 2014. Our power stations are ageing fast. We have eked out their lifespan for longer than expected, but replacements are urgently needed. Yet for years, our politicians have failed to act, promoting costly and over-subsidised renewables rather than building new gas or nuclear plants. To make matters worse, much of our capacity has been scrapped, in compliance with environmental restrictions set in Brussels. 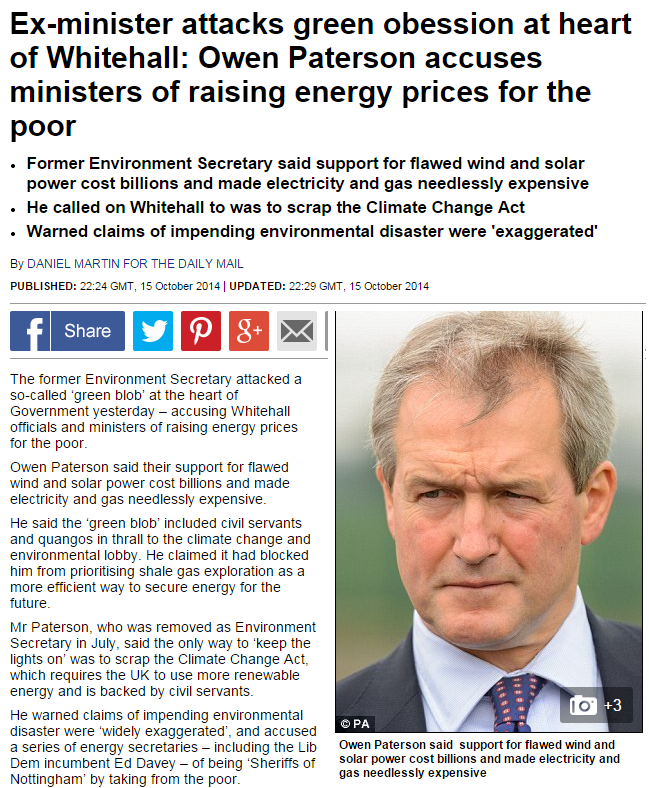 Former Environment Secretary said support for flawed wind and solar power cost billions and made electricity and gas needlessly expensive. He called on Whitehall to was to scrap the Climate Change Act. He warned claims of impending environmental disaster were 'exaggerated'. In a shocking assessment, National Grid last week said that Britain’s cushion of spare generating capacity had sunk to just 4pc, down from 17pc three years ago and its lowest level in five years. And that’s despite a series of emergency measures, including incentives to business to use less power, to deal with the looming blackout problem. That a country of Britain’s size, status and relative prosperity is running such risks is a quite shocking state of affairs. 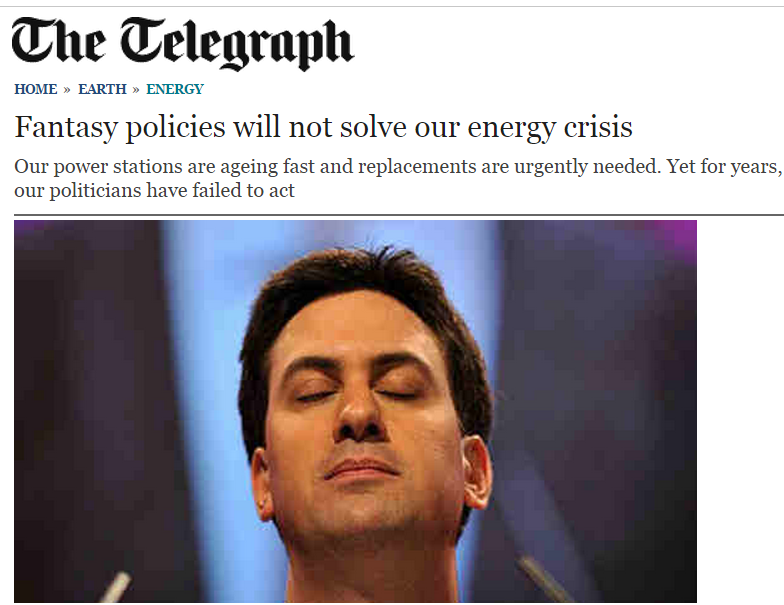 There is admittedly some justification in Mr Davey’s excuse – that this is largely the fault of the last lot, and particularly the disastrously inadequate and idealistically minded energy policy run by our now friendless Labour leader, Ed Miliband. Replacement, base load generating capacity takes a long time to build, and it should have begun a long time ago. 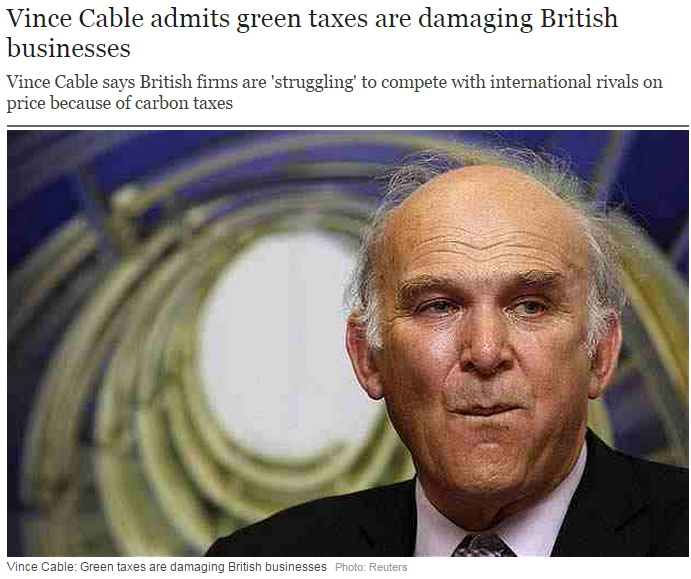 Green taxes on energy are undermining British businesses by imposing costs which are not faced by international competitors, Vince Cable has said. The Business Secretary admitted that a compensation scheme for heavy industry introduced by the government in 2011 is failing to "go the whole hog" and redress the balance. He said that British firms are "struggling" to compete with their international rivals on price, which is leading to work going abroad. "Many of our manufacturing companies and exporters – particularly in areas like steel and cement and others which consume lots of electricity – are struggling against international competition because of the cost of energy. "They will argue that because we are trying to be green we are imposing costs on them which their competitors don't have. The Germans, the British, "they are prepared to make sacrifices to address", including suffering some health and overall diswelfare. 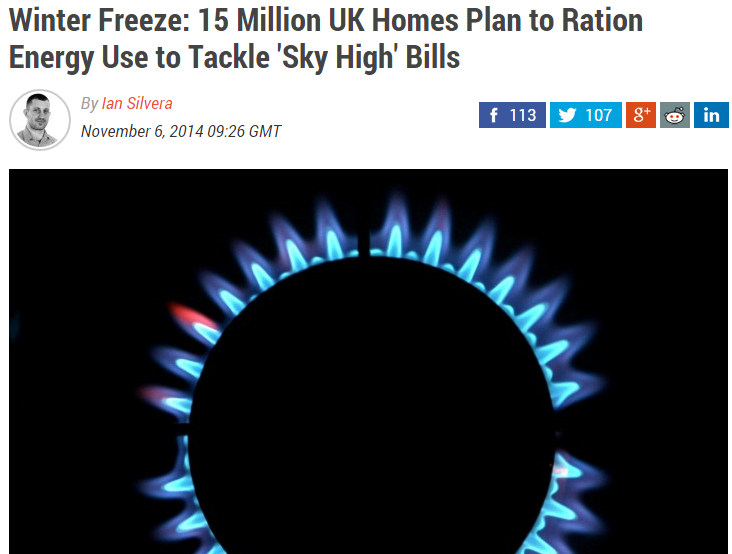 More than 15 million UK households plan to ration their energy use this winter to cope with "sky-high" energy costs, according to uSwitch. The price comparison website, which surveyed 5,300 people, found that almost six in ten (57%) people have already cut back or plan to ration theirenergy use this winter in a bid to reduce bills. The research also revealed that more than a third of people (36%) who rationed their energy last winter said it affected their health and wellbeing. "In this day and age it's shocking to see so many being forced to go without heating and risk their health, simply to cope with high energy bills," said Ann Robinson, director of consumer policy at uSwitch. Subsidies that will cost households £14 a year and hand energy companies windfall profits to keep the lights on will be “challenging to defend politically”, a credit rating agency has said. Companies will receive the payments to stop them closing power stations, even though in many cases they would remain open anyway. 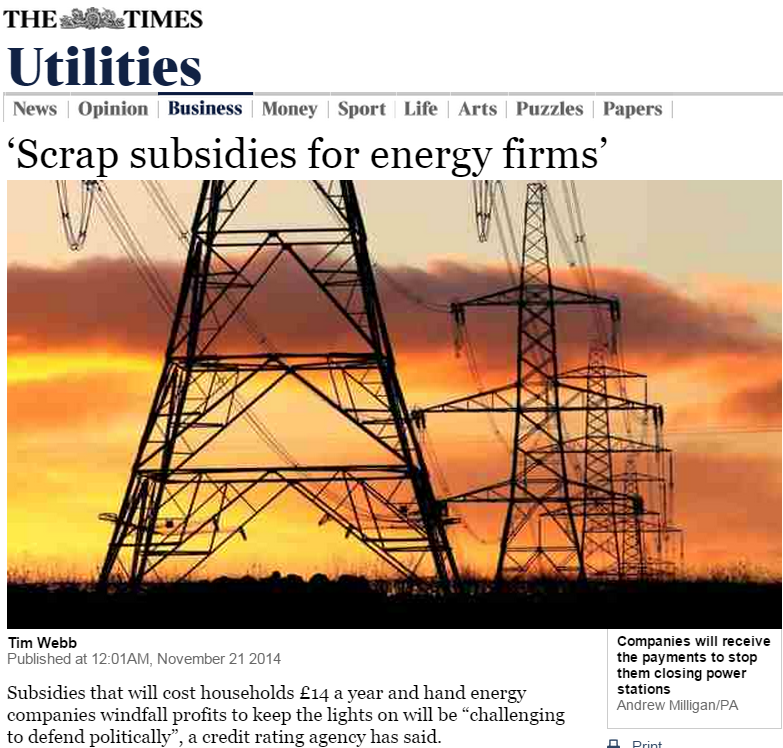 Moody’s suggested that politicians could scrap the capacity market subsidy scheme if there is another backlash against green energy levies. By promoting expensive forms of electricity – and discouraging cheaper forms, as the World Bank has done by, for example, refusing to finance coal-fired power plants – the West is burdening poor countries with the most expensive ways of generating power. The growing fleet of renewables in Europe, particularly in Germany and the UK, is leading to an increase in fuel poverty. Such an approach would be even more damaging in poor nations, which desperately need cheap and reliable energy and growth to alleviate poverty. 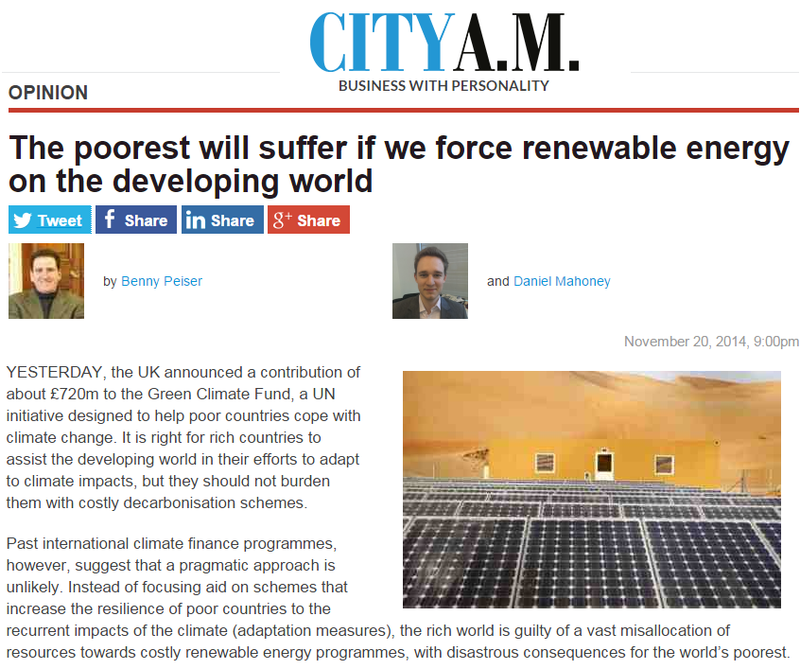 The UK and other rich nations should no longer fund decarbonisation in the developing world. In the short to medium term, developing countries need access to plentiful, cheap and reliable electricity. In any case, promoting renewables in the developing world is not an answer to dealing with the effects of the climate system.